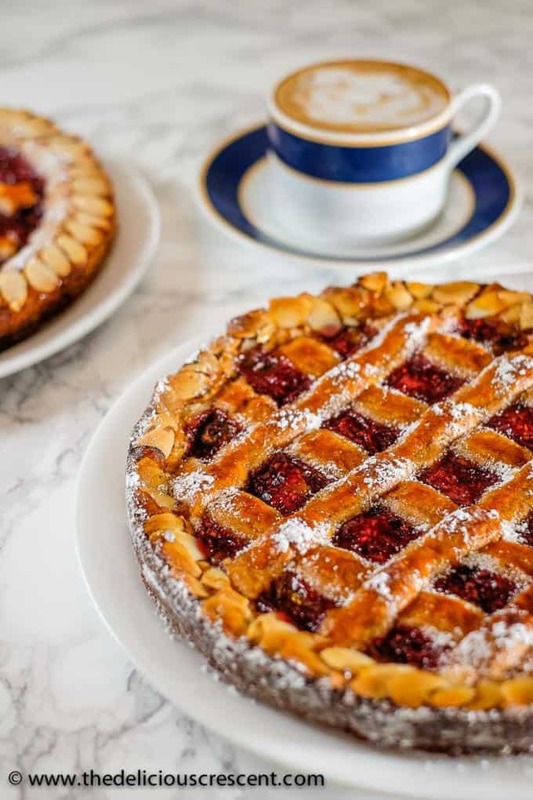 Linzer torte is a nutty, crumbly, rich pastry filled with jam and is as enchantingly pretty as it is tasty. It is easier than you would expect and delicious to the last bite! Perfect for entertaining. Step by step photos at end of post. 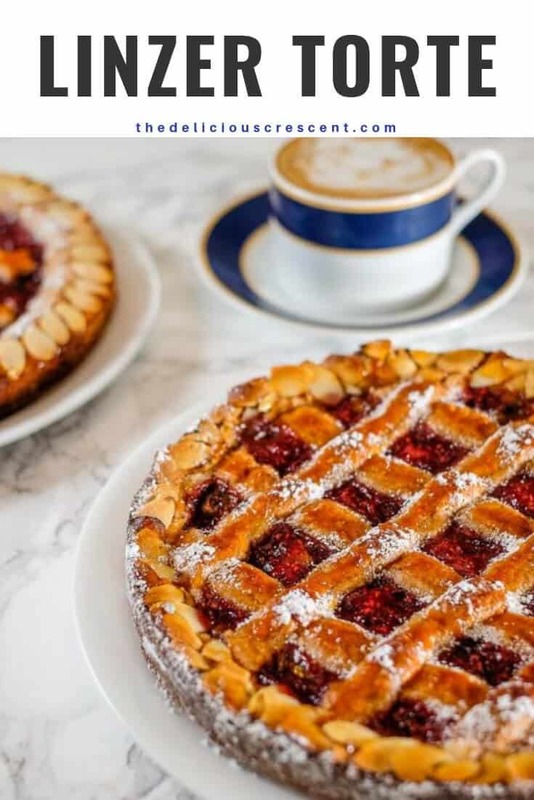 Linzer torte is known worldwide as a Viennese pastry, although it is quite common in Germany and neighboring countries. It is made with a buttery pastry dough with a significant amount of ground nuts, typically hazelnuts, but often with almonds or walnuts. With a lattice design on the top, it is traditionally filled with red currant jam; but raspberry, apricot and plum are quite popular too. I actually learned more about it after my exposure to German cuisine, and you can find it all over in German bakeries. The recipe I shared here, is the classic version. And as always, I like to make some suggestions for those who want to modify it as per their need or choice. The dough used for Linzer torte is slightly more coarse than what is used for making a classic pie. It will easily allow for the substitution of half the flour with whole wheat pastry flour. I have done it with good results. Also, I use whole almonds with the skin when processing them before adding to the dough. Dairy-Free: To skip the butter you could combine equal amounts of ultra smooth nut butter and light olive oil and use it instead, as I do with great results in this vanilla crescent cookie recipe. If the dough is a bit tough to handle, add some oil as needed. If it is difficult to roll it out, just place the dough in the baking pan and using your fingers flatten it to cover the base of the pan. Also, use oil as needed to make the dough more workable. And use cookie cutters to create a pleasing pattern on the top, rather than a lattice design, if that is easier with gluten free flour. Reduced refined sugar: You may use ready made jams made with maple syrup, honey or fruit juice. Or prepare a chia seed and honey/maple syrup based jam at home, like in this jam recipe. Make sure that the jam is thick. So cook down the fruit well and add sufficient chia seeds. It should not be runny or watery. Process the nuts as fine as possible, but make sure it does not blend into a paste. Adding some sugar while processing the nuts may help with this. Toasting the nuts before processing the nuts adds extra flavor, especially if using hazelnuts. But it would be even more important to watch that the nuts don’t turn into a paste while processing with toasted nuts. Chill the dough before rolling it out. If it becomes too firm, let it rest at room temperature to soften and flatten with fingers to make it more pliable. Make Ahead: This recipe is great for that. You can freeze this at every step of the way. After making the dough, after shaping the torte base in the baking pan, after adding the layer of jam and after fully shaping the pastry but before baking. Just thaw before baking. 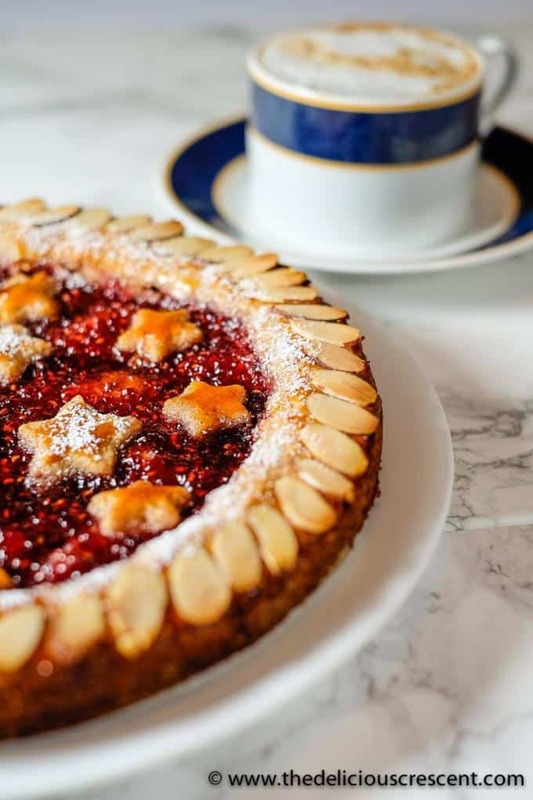 Linzer torte, a nutty, crumbly, rich pastry filled with jam and as enchantingly good looking as it is tasty. It is easier than you would expect and delicious to the last bite! Perfect for entertaining. Step by step photos at end of post. Using the paddle attachment, cream the softened butter and sugar in a stand mixer, at a medium speed. Add the two egg whites and one egg yolk and continue to mix until fluffy. Next add vanilla, cinnamon, almond extract, ground cloves, salt, baking powder and mix it. Then add finely ground almonds and mix that in. Next, add the flour in two installments and mix it in. Increase the speed and knead the mixture into a smooth dough. The dough can also be made by hand. Divide the dough into two portions. One you can use for the classic Linzer torte. The other for the fancy version. (Tip: May wrap the portions with cling wrap and freeze to use later). Take one portion of the dough and cut out 2/5th (40%) of it. Roll it out into a circle, dusting with flour as needed. You can also roll out the dough between two sheets of wax paper. Cut narrow strips using a pizza cutter or a sharp knife. Refrigerate to allow the strips to firm up while proceeding with the next steps. Roll out the remaining 3/5th (60%) of the dough into a 10 inch circle, dusting the work surface with flour. Prepare a springform pan by lightly applying butter all over and lining it with a parchment paper circle in the bottom. Open the ring of the springform pan and transfer the dough circle using a floured cake lifter (or a flat lid) on to the base. Close the ring around the springform pan and using your fingers, press the dough about one inch up the sides of the pan. Take about half the jam and spread it out evenly on the dough circle. With the help of an offset spatula lay about four to five of the narrow strips over the jam, parallel and evenly spaced. Repeat with laying four more strips in the opposite direction to create a lattice pattern. If the strips break, just patch it up and it will bake fine. Trim the edges of the strips. 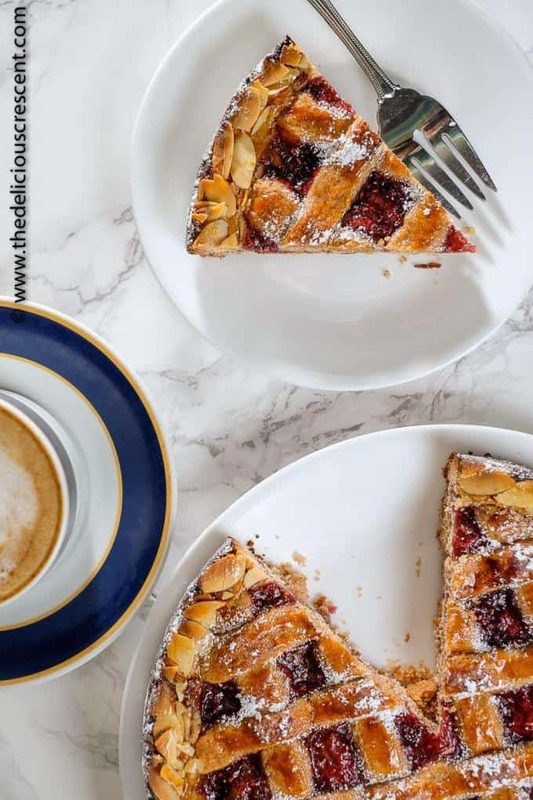 Use the remaining strips to create a border at the outer edge of the Linzer torte, where the strips join the bottom crust. Seal the outer edge using a fork or spatula. Whisk the other egg yolk (add few drops milk if needed) and brush all over the pastry strips. Decorate the outer edge of the torte using almond slices. Take second portion of the dough and cut out about 2/5th (40%) of it. Roll it out into a circle, dusting with flour as needed. You can also roll out the dough between two wax papers for ease. Use small (1/2 to 1 inch) cookie cutters and cut out shapes of your preference. With the remaining dough, roll out rope shaped strips of 5 to 6 inches long. Proceed with the 3/5th part of the dough following steps 3 to 7. Arrange the cut out shapes evenly spaced over the jam layer. Use the rope shaped dough strips to create a border at the outer edge of the Linzer torte and flatten with a spatula. Preheat oven to 375 degrees Fahrenheit. 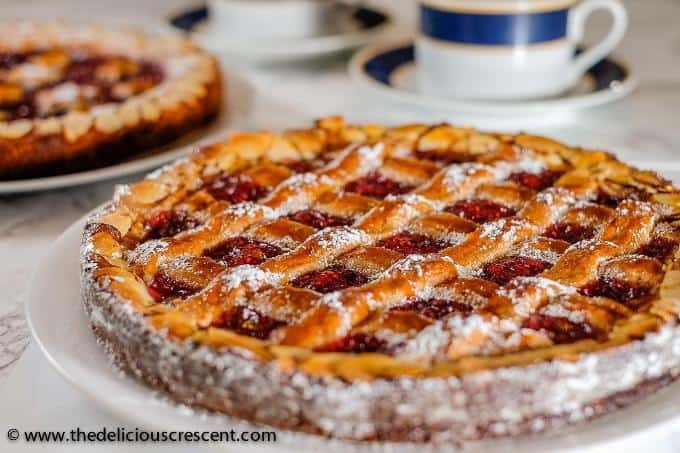 Place the baking pan in the center of the oven and bake the Linzer torte for 25 to 35 minutes until golden brown. Remove from the oven and let it cool for some time. Using a butter knife or spatula loosen the torte from the pan, release the ring and let it cool completely. Dust with powdered sugar. It is best to slice and enjoy it the next day. This torte keeps well at room temperature for few days, but you may also refrigerate it for a week. It can also be frozen. Cream butter with sugar. 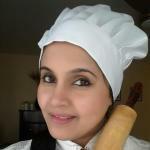 Whisk in egg whites, yolk, flavors, salt and baking powder. Then add ground almonds. Next add the plain flour and knead into a smooth dough. Divide it into two portions. Make the base of the Linzer torte with part of the dough. Then spread the jam over it. Use remaining part of the dough and cut out thin strips. Arrange the strips crosswise in a lattice pattern. Use strips of the dough and seal outer edge of the torte. Brush egg wash and decorate with almond slices. With the second portion of the dough make a fancy cookie pattern. 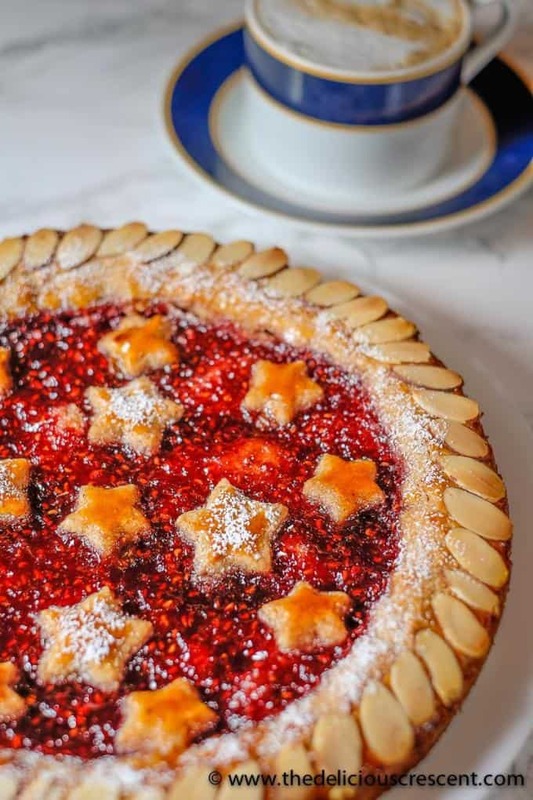 Cut out stars shapes using cookie cutters and arrange over the second Linzer torte. Use remaining dough to make rope shaped strips and arrange it on the outer edge and flatten it with a spatula. Brush egg wash and decorate with almond slices. Let cool after baking and dust powdered sugar on the top. How gorgeous! I’ve heard of linzer cookies, but not linzer torte. I’d love to try this! Great job with this post. Thank you so much Andrea for your lovely feedback. Linzer torte tastes fantastic. You will love it. This is such a gorgeous dessert! Perfect for the holidays! So happy you like it :) Thanks Jessica. Ahhh, such a classic! I haven’t made this in quite a while. Thanks for the inspiration! Thanks Catherine. Hope you enjoy making it again. I’ve never had a linzer torte but I love linzer cookies so I’m sure I will love this. They are both beautiful and so festive for the upcoming holidays. Thank you Kelly. Its really very tasty. Yes they are so festive and fun to make also. This torte is absolutely beautiful! I hope mine turns out the same!